...to the searing dunes of Tatooine. Lightsabers clash and legends are created as champions of Republic and Empire rise and fall. 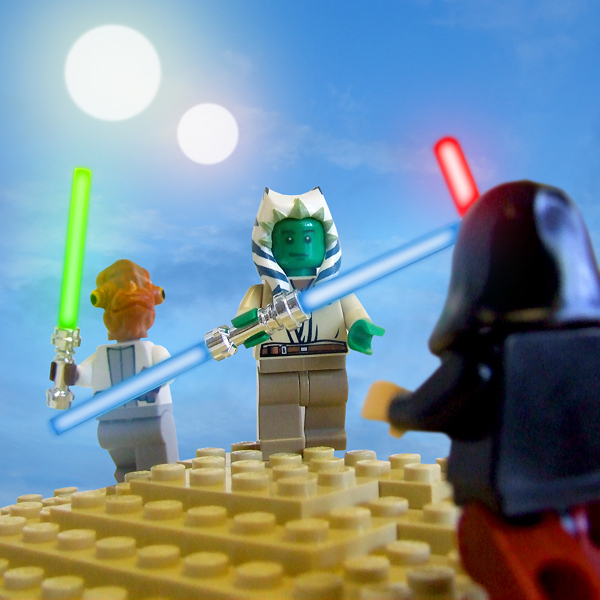 Note: Jedi Duel is a fan-made combat game, made out of love for LEGO and Star Wars to be played by fans. Duel Sequence core combat system copyright © Peter Hentze. All intellectual properties copyright © their respective owners. 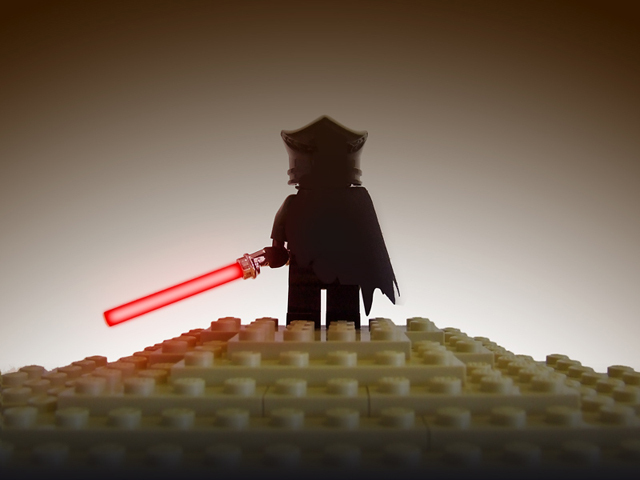 Jedi Duel is a fast paced, forum based combat game set in the LEGO Star Wars universe where players use their LEGO collection to create and name their own custom Jedi or Sith character to duel against opponents. As they progress, they master exciting Force abilities or harness the power of the Dark Side on their path to becoming a champion of light… or darkness. Jedi Duel requires 3 players to play: 2 players and an Adjudicator. If together in person an Adjudicator is not required but players will require some paper and a pencil or pen in addition to their custom LEGO minifig. First, each player must create and name their original character. Some background is an excellent way to flesh out their fledgling character. An allegiance - Jedi or Sith - should be chosen at this time. Initially, characters start as Younglings, but will quickly progress as they fight more duels. An image of the character together with backstory should then be posted on forum so all Jedi Duel players can see and compare characters. Then by mutual agreement, or by challenge, players select an opponent to duel! Note: The Adjudicator should have a good grasp of the rules and abilities of Jedi Duel to allow play to progress smoothly. •	Players list their character’s Duel Sequence and send privately to Adjudicator. •	Duel Sequences are compared by Adjudicator; damage and health reduction is calculated. •	Players begin next round. •	First character to lose all health loses duel - winner is celebrated! Duels consist of 3 rounds but may be shorter or longer depending on the progress of the duel. During each round a player selects and writes a list of 5 actions for their character to perform. This is called a Duel Sequence. An action can be an attack, parry or a use a powerful ability; damaging their opponent, blocking, countering or a combination thereof. To begin the first round, players list their character’s Duel Sequences and send them to the Adjudicator who compares the sequences and calculates the damage inflicted and health reduction. The Adjudicator then posts the results for everyone to see. Play continues with a second round and third until one character has triumphed, reducing his opponents health to zero or having most remaining health after 3 rounds. In the event of a tie, the first character whose health was reduced to zero first loses. If a tie happens simultaneously then an extra sudden death round is played – see the sudden death section for details. Attack: Attacks form the basis of the Duel Sequence. There are 4 types of attacks: low attack (LOW), medium attack (MID), high (HIGH) and kick (KICK). LOW attacks defeat MID; MID defeat HIGH; HIGH defeat LOW. A KICK attack will defeat a parry action, but is defeated by any other attack. Parry: A player can use a parry action to block an attack. A block nullifies most potentially damaging attacks. A parry can be defeated by a KICK. Force Abilities: As characters duel and become more experienced so they learn in the ways of The Force – or Dark Side – and gain special new abilities. A chosen Force ability can be used once per round. These have a variety of uses and effects and can sway the tide of the duel substantially! See the Force abilities sections for details. Mastery Abilities: Mastery abilities represent the peak of a Jedi or Sith’s skill and are the most powerful – and dangerous – abilities in the game. See the Mastery abilities sections for details. A counter occurs when players select the same attack at the same point in their Duel Sequence. In this event, neither character receives any damage. All characters begin a Jedi Duel with 5 health. Every winning attack in a Duel Sequence inflicts 1 damage on their opponent, reducing health by 1. When a character’s health is reduced to zero, it automatically loses the duel. Duels generally consist of a maximum of 3 rounds and, in the event of a tie, a sudden death round. If a character is reduced to zero health before the end of any given round then they automatically lose the duel in that round. This means a character can potentially be defeated in the first round of their duel with no need to continue! If both characters are tied on health at the end of the 3rd round, a sudden death round is played. The first character to be dealt damage loses the duel. In the event of a tie in the sudden death round the duel is considered a draw. Jedi Duel allows players the chance to watch their character progress, from Youngling to Jedi Master or Sith Lord. Progress is measured in 5 ranks: all characters begin as Younglings, possessing no additional Force abilities. After each winning duel a player increases by one rank, ultimately becoming masters of The Force or powerful wielders of the Dark Side. •	Youngling - Possesses no additional Force Abilities. •	Jedi Padawan / Sith Apprentice - Player can choose 1 extra Force Ability. •	Jedi Knight / Sith Warrior - Player can choose 1 Mastery Ability. •	Jedi Master / Sith Lord - Player can choose 1 extra Mastery Ability. Players must keep a record of their rank and abilities where they can be seen by everyone. 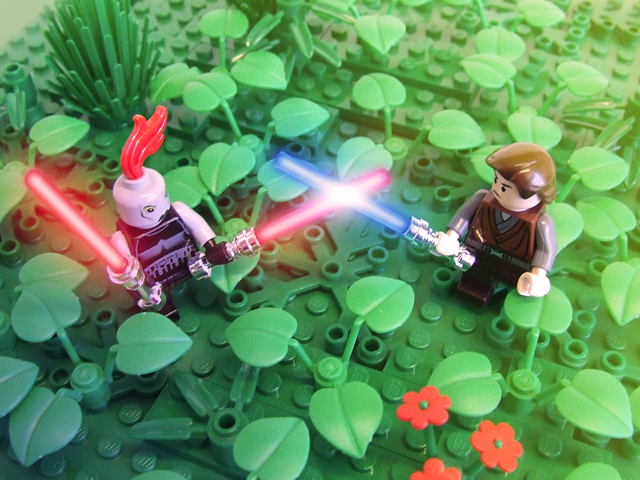 As characters duel they become more experienced, more skilled with the lightsabre and with the Force. To represent this, characters choose a new Force ability every time they gain rank, choosing a Mastery ability (see Mastery Abilities) upon reaching the highest rank. Once a player has chosen their character’s abilities, these CANNOT be changed. Only by creating an entirely new character (or restarting their current character) will they be able to choose a different path. To use a character’s Force ability, players simply list it where they want in the Duel Sequence. Only one of each type of Force ability may be used in a round, but more than one different type of Force ability may be used if a character possesses them. Below are listed the selection of Force abilities. •	Force Push - A powerful surge of the force which blasts an adversary off their feet. Blocks opponents attack while simultaneously performing a KICK attack. 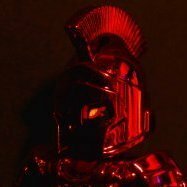 •	Sabre Throw - The Jedi throws his lightsabre and guiding it using the Force, strikes his adversary at their weakest point. Defeats any attack. Blockable. •	Force Shield - The Jedi creates a powerful Force barrier against his opponent. Completely cancels opponent’s action. •	Force Lightning - The Sith focuses the Dark Side into a devastating lightning attack. Defeats any attack. Blockable. •	Force Choke - Using the power of the Dark Side, the Sith reaches out with the Force and strangles his opponent. Completely cancels opponent’s action. Note: Jedi and Sith abilities have similar effects but are defined as their alignment would suggest. Abilities with the same effects will counter each other, i.e. Sabre Throw counters Force Lightning and vice versa. Mastery abilities represent the pinnacle of Jedi or Sith ability, skills and techniques they have refined that make them an awesome adversary! Some mastery abilities are used in a similar way to other abilities in as such they need to be listed in the Duel Sequence. These are called active Mastery abilities. Mastery abilities that are in continual effect and don’t require to be listed are called passive abilities. 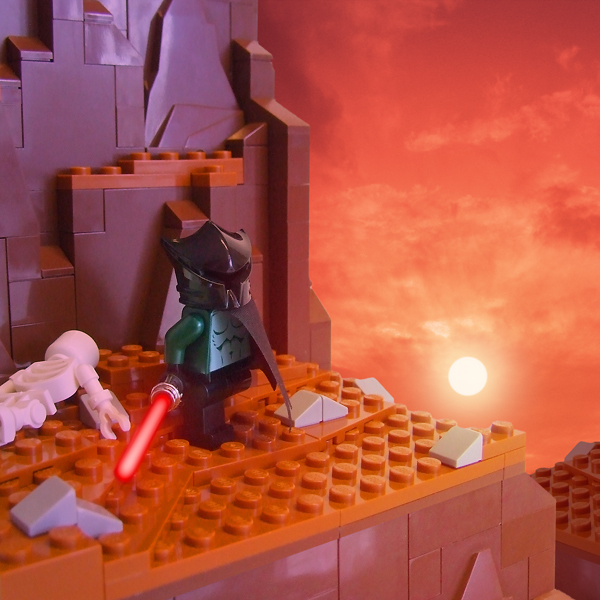 •	Battle Meditation - The character can use the Force to sway the outcome of the duel, conferring the following abilities: 1) During the second round the character can opt to reduce the duel by one round. Character automatically blocks when this ability is used. Active. 2) The character always wins Sudden Death rounds automatically. Note: When 2 characters with Battle Meditation duel, their Meditation powers cancel each other out! •	Endurance - Renown for their strength and stamina, the character adds +1 health. Passive. Note: Endurance Mastery Ability only increases a character's health by 1, it doesn't give the character the ability to regenerate or gain health each round. •	Force Adept - A powerful disciple of the Force, can choose an extra Force ability but is limited to using 2 per round. Passive. •	Sabre Flurry - Armed with 2 lightsabres or a twin lightsabre, the character can cause 2 damage with a single LOW, MID or HIGH attack per round. Active. •	Combat Master - Unparalleled with the lightsaber, attack counters cause 1 damage to opponent. Attacks affected are: High, Mid, Low, Kick, Sabre Throw, Force Lightning and Sabre Flurry. Passive. Note: Because of the defensive nature of Parry, Force Push, Force Shield and Force Choke (and the fact that this ability primarily affects attacks) these are not affected by Sabre Master. Action - Attack, block or ability. 5 are listed in the Duel Sequence. Block - Action which prevents damage i.e. parry. Character - A players’s custom character. Can be Jedi or Sith. Counter - Drawn attack. Automatic block for both characters. Damage - Damage inflicted upon a character. Reduces health. Duel - A complete game of Jedi Duel. 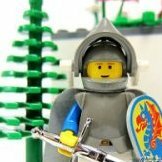 Duel Sequence - A list of 5 actions a player determines their character to perform in a single round. Health - Total and remaining damage a character can sustain. High - High Attack. Defeats low. Force Ability - Selectable special ability. Chosen when character increases in rank. Kick - Kick attack. Defeats parry. Defeated by any other attack. Low - Low attack. Defeats mid. Mastery Ability - Selectable special ability. Chosen when character achieves highest rank. Mid - Medium attack. Defeats high. Round - A single segment of game time where a Duel Sequence is listed, compared, calculated and shown. Sudden Death - Extra round to determine duel outcome. The table below details shows at a glance which attacks damage, counter, block or are cancelled. Thanks to Kaitan for creating the table! Hope you enjoy playing Jedi Duel! The spirit of the game comes from creating your own Jedi or Sith, dueling others and watching your character grow and become a powerful warrior! Please feel free to fire away with any questions. These rules are taken directly from my rule document which includes a play example (which I'll most likely post soon). If you'd like a copy for yourself, to print out and maybe play with more of your friends, send me your email address by PM and I'll sort it out for you. The Character Databank. Upload your characters here. The Dueling Thread. Where the duels take place. Please only post questions and discussion in this thread, and characters etc. in the relevant threads. I'll adjudicate as many games as I can. Once people have the hang of the rules they'll be able to adjudicate too so the duels won't rely on me being online.The more players we get involved the more Jedi Duels there will be! John, Harry and Tessa have decided to play a game of Jedi Duel. John has agreed to act as Adjudicator while Harry plays using his Jedi Padawan, Jace Tillius, and Tessa uses her Sith Apprentice, Darth Rayde. Jace Tillius has the Force ability Force Push. 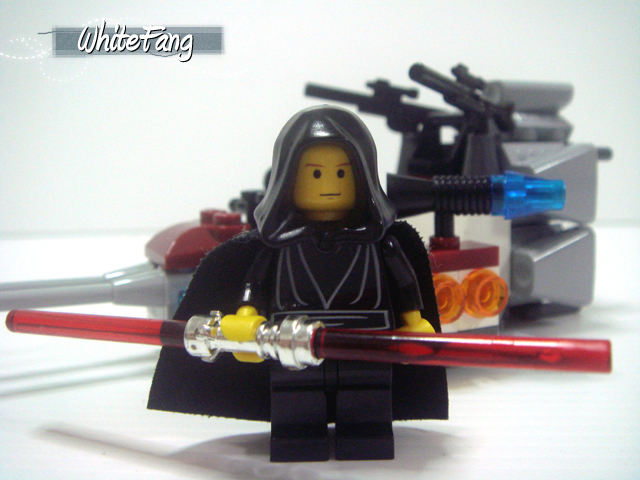 Darth Rayde has the Force ability Force Lightning. From this Harry can see Jace Tillius has the upper hand - Tessa has to win if Darth Rayde is to defeat the cursed Jedi! This sounds fun. I do have a question, the character thread you mentioned is that where you post characters that the players pick from? I'm assuming that the players will tell you what they want their jedi/sith to look like and you'll make them if you have the parts. Or is it where the players make their character and photograph it? Sorry if I'm confusing you but I'm not sure. Also is this the sign up thread? If so I'd be interested. I'm also jealous of your chrome hits. Very well presented Pedro, good job. This looks like it will be a fun game for all. And what's this? Something on the frontpage, perhaps? So off I go to make a sith. I'll make um...I'll make...uh....A Force-User! I guess we'll se tomorrow. - Can I use my Star Wars Comic Game character (ie, a character I've already created)? - How and when do we level up? The user already has Force Push and Saber Throw, and chooses to add Force Shield with the Force Adept. In Round 1, user uses Force Push and Saber Throw. In Round 2, can user switch to using Force Push and Force Shield? And when Force Adept is used, that means the user has all three possible Force Abilities? - Is Force Shield the EXACT same as Force Choke? Under Choke it says it can be countered, while Shield doesn't say it. You did say "mirror" abilities counter each other. - Do the challengers have to be online at the same time? So the rounds go quickly? Or does it happen whenever the players happen to be on? The game sounds simple and fun. Thanks for hosting, pedro! This looks awesome! I've had a Jedi built for a while...I guess I gotta break him out. Bring it on, Sith scum! Sounds intriguing. I'll play but have had no previous experience with these Lego games so I dont know what to expect. WOW looks like an excellent game Pedro! Im going to enjoy watching it at the moment. Cannot neigh to save his life. Wow! I haven't played a game like this before! It sure sounds fun. I'll see what I can whip together. Cool, sounds very fun and I will definatly join in. Thanks for the frontpage Dragonator! Players build their character, photograph and post it with the relevant background. As they progress they can note their rank and abilities on their 'character sheet' too. Absolutely! In fact you can create more than 1 charcater if you want, each will have to start at Initiate / Acolyte rank though. Each win at Jedi Duel with increases your character's rank by 1. Your example is pretty much spot on. As Force Adept you have all 3 Force abilities but can only ever use 2 of them in 1 round. To all intents and purposes, a counter with these 2 abilities will do nothing as they cancel each other out. The counter aspect only comes into play when using the Sabre Master Mastery ability. Ideally yes, 2 players and an adjudicator have to be online at the same time. It shouldn't take long to play througha duel... and gain that extra rank! Wow, awesome sounding game. I'll be posting a character and playing for sure. Cool I'll definetly play! Do the figures have to be flesh or yellow? I'm in! Soon I'll try to make a minifig. Do the figures have to be flesh or yellow? As you know, I've been waiting for this for a while, so I'm definitely in! Great to see so many interested! Can't wait to see alll the Jedi and Sith we create. Nice one... you have just the Jedi too! And the Character Databank is now open! Post your characters here. Cool, I might be able to put something together, This looks fun! Sure, I'm in! Just two questions - One, can the figs be custom (custom custom, as in painted) and two, will there be a tutorial match...? I must say great job on setting this up, as a Star Wars fan, I'm sad to miss this but as a new player i only want to participate in one game at a time. I just had to post to say i love your picturs and great job on designing this game. Yes and yes! I have a play example I'll be uploading here soon. Cheers, I appreciate it! You'll find you might actually be able to fit this in alongside any other game. Jedi Duel is designed so it can be played very quickly, whenever you (and 2 others) like. Create your character and you're ready! You'll see the play example soon and the flow of the game. Hopefully we can get some duels in tonight once people start uploading their characters. Cool! But I'm afraid I won't be able to do my avatar for ages. I'm afraid I'm away on a course. Can I possible post in and join late? Can I possible post in and join late? Definitely, join whenever you can then duel whoever you want.